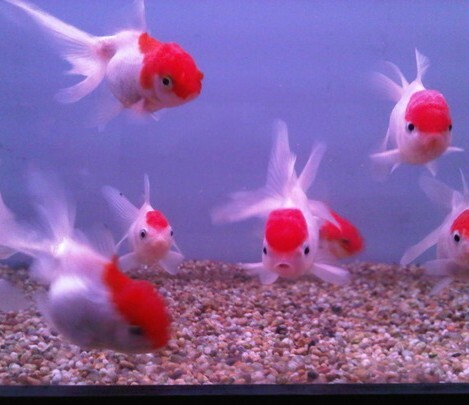 Red Cap Oranda cold water fish. They grow up to 20 cm / 8 inches fully grown. They live in water parameters of PH range 6.5-7.5 and temperatures of 17-24 Celsius / 65-75 °F. They are lovely peaceful cold water fish. There main feature is there lovely bright red hood that covers there head. As they grow this hood gets bigger. They are a shy fish so mixing in small groups or with other peaceful cold water fish the same size is best. With the red caps we recommend sinking there food as if they eat of the surface of the water they can gulp in air and cause there bellies to bloat, and stress the fish out.. They eat flake, granular, and pellet foods. They will also enjoy some freeze dried, frozen or live foods. Red caps enjoy flakes, pellets and granular foods in there diet. Also freeze dried, frozen or live foods for treats.